Also serving communities of Howard, Suamico, Luxemburg, Pulaski. There are 30 Assisted Living Facilities in the Green Bay area, with 24 in Green Bay and 6 nearby. The average cost of assisted living in Green Bay is $3,382 per month. This is higher than the national median of $3,346. Cheaper nearby regions include Brillion with an average starting cost of $3,079. To help you with your search, browse the 95 reviews below for assisted living facilities in Green Bay. On average, consumers rate assisted living in Green Bay 4.3 out of 5 stars. Better rated regions include De Pere with an average rating of 4.3 out of 5 stars. Caring.com has helped 10 families in Green Bay find high-quality senior care. To speak with one of our Family Advisors about assisted living options and costs in Green Bay, call (855) 863-8283. Home of the famed Green Bay Packers, Green Bay is the flagship city and economic hub of northeastern Wisconsin. It has a population of over 105,000 residents, 12.3 percent of whom are aged 65 years and older and may require help with daily tasks. To serve this demographic, there are 33 assisted living facilities in Green Bay, which fall under one of four classifications: community-based residential facilities, residential care apartment complexes, adult family homes and adult day care. While these cater to different residents, they are all regulated by the Department of Health Services. Compared to the U.S. national average of 100, the cost of living in Green Bay scores 88.9, which is also lower than the statewide average of 98. This is largely due to low housing, transportation and grocery costs. Crime rates in Green Bay are higher than they are on average across the state of Wisconsin, in terms of both violent and property crime. On a scale out of 100, with 100 representing high crime, the city scores 28.8 and 33.6 in those categories, respectively. Green Bay offers many diverse recreational and entertainment options that cater to diverse interests, including the National Railroad Museum, the Packers Hall of Fame, the Green Bay Botanical Garden and performances at the Meyer Theater. Residents of Green Bay experience cold winters. Temperatures can drop to a low of 9 degrees, and over 50 inches of snow is expected to fall each season, which may be difficult for seniors who enjoy the outdoors. Green Bay has an array of community resources for seniors, including Curative Connections, an organization that provides programming, care and services to help foster a sense of independence in aging adults, as well as several senior centers. The Green Bay Metro provides a fixed route transportation service throughout the city and has a reduced fare program in place for seniors age 65 and older. Curative Connections also operates the Brown County Specialized Transportation Program, which offers door-to-door service for residents ages 60 and up. Assisted Living costs in Green Bay start around $3,382 per month on average, while the nationwide average cost of assisted living is $4,000 per month, according to the latest figures from Genworth’s Cost of Care Survey. It’s important to note that assisted living rates in Green Bay and the surrounding suburbs can vary widely based on factors such as location, the level of care needed, apartment size and the types of amenities offered at each community. 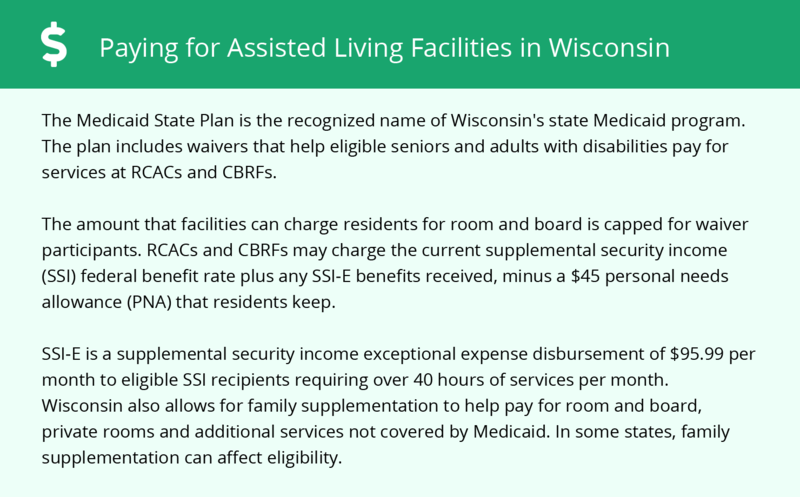 Wisconsin's state Medicaid program offers several waivers to assist with services at assisted living facilities. 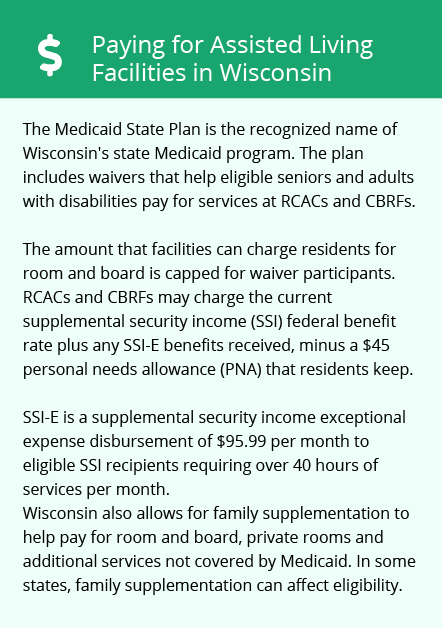 Waiver participants' room and board costs are capped at the federal SSI benefit rate plus any SSI-E disbursement, minus a $45 personal needs allowance. Green Bay and the surrounding area are home to numerous government agencies and non-profit organizations offering help for seniors searching for or currently residing in an assisted living community. These organizations can also provide assistance in a number of other eldercare services such as geriatric care management, elder law advice, estate planning, finding home care and health and wellness programs. To see a list of free assisted living resources in Green Bay, please visit our Assisted Living in Wisconsin page. Green Bay-area assisted living communities must adhere to the comprehensive set of state laws and regulations that all assisted living communities in Wisconsin are required to follow. Visit our Assisted Living in Wisconsin page for more information about these laws.